We returned from the Intermission to find a chocolate bunny had been placed at every place setting that had been occupied by someone under 18 during the previous course. Apparently the Easter bunny had made a stealthy visit to the Hobbit while we were occupied with the kitchen tour. The little one was most delighted. We were then all treated to a pallet cleansing serving of blood orange sorbet. I’d never had blood orange sorbet before, and I thought it had an interesting citrus yet tangy flavor. Then came the main course, Beef Wellington. (If you were not red meat inclined, they also had an alternative entree of grilled swordfish, but all of us got the Wellington.) Unlike the lamb, the beef was perfectly cooked, and mashed potatoes were light and fluffy, which was a nice contrast to the thick cut of meat wrapped in puff pastry. It was declared our favorite dish of the night. After our food had time to settle a bit we were presented with the last course of the night – dessert! 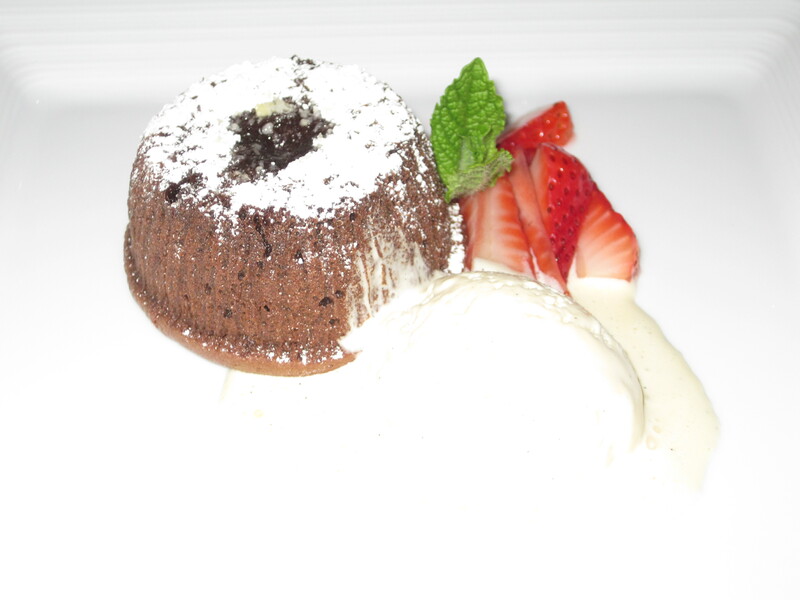 It was simple, but decadent, chocolate molten lava cake with homemade vanilla ice cream. If you have ever had the lava cake at Morton’s Steakhouse, this was very similar, but the homemade vanilla ice cream was a nice touch, as was the full bodied port wine that that accompanied it. With that, our culinary adventure was complete. We bid our hosts farewell and headed out well fed. Now I will warn you, even with the occasional specials, The Hobbit is not a dinner to be taken on lightly when it comes to cost. This is a Special Night Out, and it comes with a Special Night Out price tag. Although, after being asked to cough up $20 a ticket to see an Imax movie on a recent date night, the cost is seeming less heart attack inducing. Nonetheless, expect The Hobbit to be… Pricey. But it’s well worth it! At least once every couple of years.